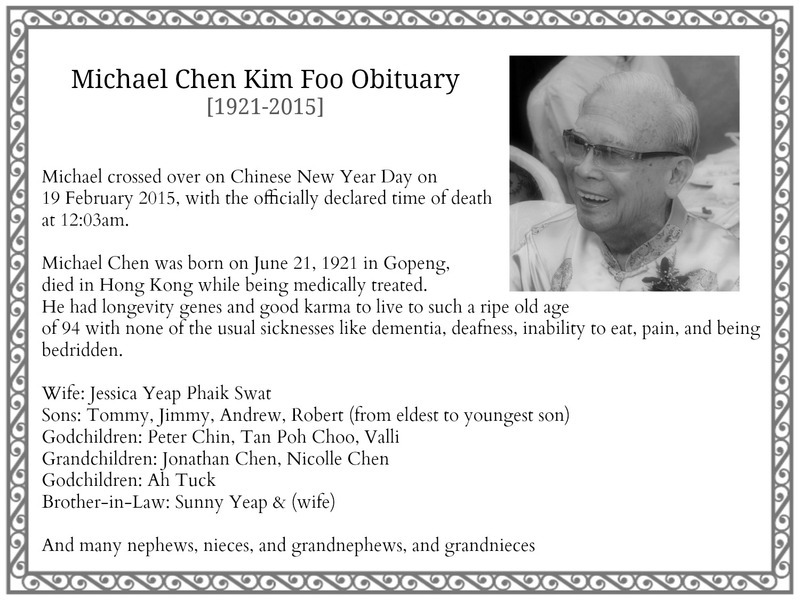 Michael Chen Kim Foo crossed over on Chinese New Year Day on 19 February 2015 at 12:03am. He was born on June 21, 1921 in Gopeng, died in Hong Kong while being medically treated. Hong Kong funeral mass: 12 March 2015 (Thursday) @Lai Chi Kok Hospital Caritas, Hong Kong. Cremation: 4:00pm, 12 March 2105 @Kwai Chung Crematorium, Hong Kong. Mum will come back to Ipoh with Andrew and Jimmy and will bring back the ashes on 28 March 2015. At 11:00am to 12:00 noon. Lunch served right after mass. We thank all the doctors and nurses of Lai Chi Kok Charitas Hospital, Hong Kong who did their best to take good care of him for 4 months. Please share your mindful thoughts, feelings, and pay a little tribute to Michael / Kim Foo below. Some of you may have written in Facebook, please re-write with purposeful mindfulness, or re-post your comments “as is” below. Thank you and may God be with you.